A power of work from a dedicated group of volunteers has ensured everything is right on track for the Lockhart Picnic Races on Friday. 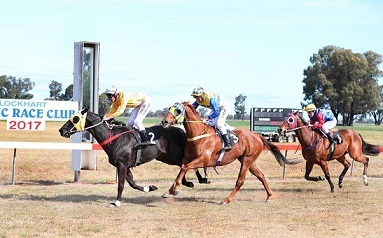 Lockhart, like most places across the Riverina, is feeling the pinch of the drought but residents have ensured it will not get in the way of their annual race meeting. Black Fusion wins the 2017 Lockhart Picnic Cup. Lockhart Picnic Race Club president Pat Gooden said getting the track in order for racing has been a team effort. “We’ve had two water tankers putting two lots of 26,000 litres each day on the track,” Gooden said. “People have donated water tankers and fellas have been driving them around. All volunteer labour. The club expects a crowd of 1500 to 2000 people to turn out on Friday. Gooden said it will be a day for farmers and townspeople alike to forget about their troubles for a day and enjoy themselves. “That’s what it’s all about,” he said. The festivities get underway on tonight night for the Cup calcutta at Lockhart Ex-Servicemen’s Club where Victorian racecaller Rick McIntosh is the guest speaker. There will be prizes up for grabs in Fashions on the Fields, while gates open at midday for the first of six races at 1.35pm. The Cup will be run at 4.15pm. Gooden wished to thank all sponsors for making the meeting possible. View the fields and form including race replays for Friday's Lockhart Picnic Races here.